Tech evangelism is more about listening than talking. Having recently presented at Azure Data Fest in Atlanta – on the topic of “BI Workloads and How They Change in the Cloud” – this latest Tech Notes blog is less about my PowerPoint slides and much about what the audience had to say. “How many of you and your business predominantly on-premises with BI/DW data platform?” At least 80% of the room was still on-premises. “How many have been directed you must move BI to the cloud?” A small number of hands went up. “How many of you would NOT consider yourselves BI/DW/Data Science type of people?” No hands went up. This was surprising as the audience was diverse. There were DataOps folks and DevOps folks. There were more traditional Data Platform stakeholders like DBAs. The reality is likely most people working with data are broadening or seeing their roles broaden to include BI/DW/Data Science. The group confirmed their architectures were predominantly fed by relational data sources coming from applications and agreed with my assertion that the data sources were generally relational (or structured). Pressed a bit further most offered there were Data Marts and/or Data Warehouses. The crowd was still warming up and I had assigned them to teams, BLUE or RED, where each response earned a point for the responding team. I found some people starting to verbalize concern about moving their Data Warehouse to the Cloud while a small group (probably two from the same company) had taken bigger steps with the cloud (Azure specifically) and were happy to report positive progress! 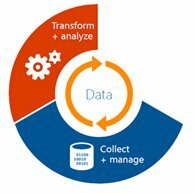 As we made our way around the Microsoft Data Platform wheel, we discussed “Transform and Analyze”. This is a fairly heavy-duty part of ANY Business Intelligence/Data Warehouse/Data Science platform as the real value starts to materialize here. Information is being transformed, prepared and modeled for inclusion in data stores, which support Analysis. 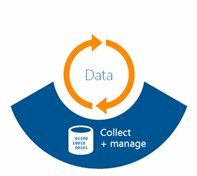 ETL or Extract, Transform and Load – is a process by which data is collected from a data source and transformed in flight on its way to a Data Mart, Data Warehouse or other decision supporting data store. ELT or Extract, Load and Transform – is a process by which data is collected from a data source and loaded initially in its originating form. The originating format of this “staged” data is then transformed after it has landed in the BI/DW environment. There was also agreement on data, especially “On Premises”, being modeled in a more traditional Dimensional Model, popularized by the Kimball Group. What makes the concept of Transform and Analyze that much heavier architecturally is not only is there a level of relational preparation of the data but there are potentially other modeling activities for structuring the data for Analysis. In Microsoft’s world, this involves Analysis Services, which was originally offered years ago and has been refined on the SQL Server platform. Today, Analysis Services is ALSO available as an in-memory offering on Azure (and it is the technology which underlies PowerBI’s in-memory data modeling) called Tabular Models. Interestingly, there was a much LARGER dependency on Microsoft’s Integration Services technology (SSIS). I’ve spent literally two decades with this technology (including DTS) and I imagine this is one of the big anchor points for most when moving from On-Premises to the Cloud. Microsoft has a technology called Azure Data Factory, which we’ll go into further detail a bit later on. The session I delivered wasn’t the time to be wearing a ZAP Data Hub hat and talking about our products but what I will also discuss in a bit more detail, later, is the simple reality that ZAP’s Data Hub seriously speeds up and makes easier the processes around “Collecting and Managing” and “Transforming and Analyzing” the data, weather information or the Data Platform be On Premises, In the Cloud or a Hybrid of the two. 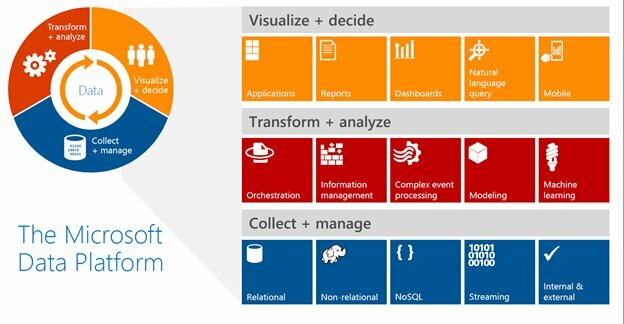 As we completed the circle of the Microsoft Data Platform Wheel, we reached the “Visualize and Decide” section. We spent a lesser amount of time speaking to the elements of this area of the Data Platform. This was due to the fact most of the audience agreed with my assertion that On Premises or in the Cloud, much of the visualization activities are still supported when you move between the two. We’ll conclude this Blog with a view of the Workloads being managed on Premises. Storage – similar to Servers plus Disk Arrays, etc.. The group agreed with all of the above and we focused on the Pro’s and Con’s of having a BI/DW/Data Science Platform On Premises. Is it an absence of “Pros” or the presence of “Cons” which are driving you to look to Azure? Do you have other concerns about moving to Azure? There really weren’t many objections but honestly, I wasn’t expecting much in this environment. At ZAP, we’ve heard people concerned about unforeseen costs and risks but it so rarely comes through with a highly technical audience. So, that’s where we will start our post next time, finishing off the recap of the session and talk about all the great interactions around the Azure technologies, which make up the Microsoft Data Platform. Who knows, maybe you have a vision of your Data Warehouse looking like the diagram below? Stay tuned and, until then, I mentioned at the start I love hearing from people! Feel free to give me a shout/follow on Twitter @TreyJohnson. Trey Johnson is ZAP’s Chief Evangelist. Based out of Jacksonville, Florida, he brings experience from leading various boutique BI software and national consulting companies. A published author, speaker, and consultant, Trey sat on the PASS Board of Directors over multiple terms, concluding as their Executive Vice President. He was a long-term member of Microsoft’s BI Partner Advisory Council and has spent the last 25 years delivering business intelligence, data warehousing, and data management solutions to businesses of all shapes, sizes and “data challenges.” Follow Trey on Twitter and LinkedIn.